Norm Smith is regarded by many as the greatest coach in the history of the Australian Football League, having transformed a battling Melbourne FC into a League heavyweight that won six premierships in 10 seasons (1955-64). 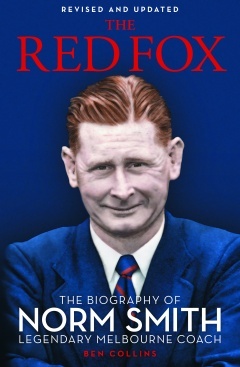 In this meticulously researched monument to Smith’s life – enriched by the recollections of more than 100 people, many of whom had played with or under the Demon dictator – author Ben Collins lays bare the man behind the legend... in all his glories and foibles. In this most captivating analysis of Smith, a portrait emerged of a frightfully hard and brutally honest coach who was ruthless in football but possessed disarming compassion away from the game. This is his story, concurrent with that of his older brother and fellow coach Len Smith, from their childhood in tough, working-class Northcote during the Depression to their status as the most in uential coaches of their generation. Available from 1 March in Paperback.